A facsimile of the full text is provided in Adobe Acrobat format, at alternative resolutions. Size of caravan - Horrors of savagedom - Ovambonde - To the Ovampo on ride - oxen - Back to Damara land - Journey in Namaqua land - Bushmen - Large game - Back to Walfish Bay - Home - Medal of Royal Geographical Society, and election to Athenaum Club under Rule II. The following review was written by C.E Gehlke (Political Science Quarterly, 1910). 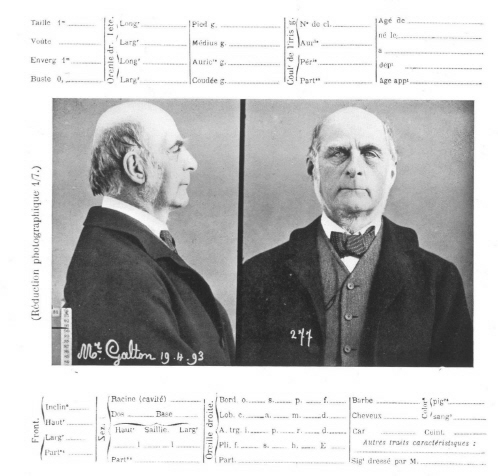 Galton as criminal, aged 71.
of the French criminologist Bertillon.